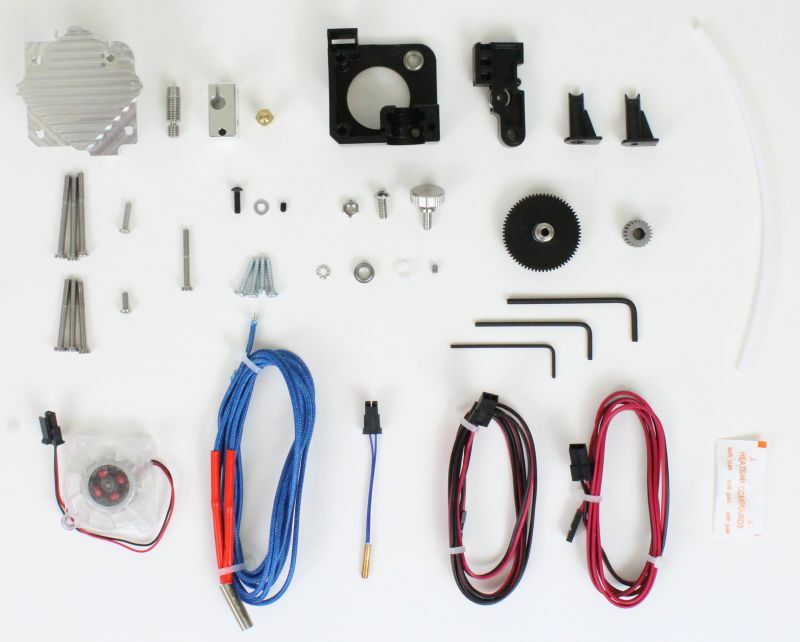 Assembling a Titan Aero has many aspects in common with both a Titan extruder and V6 hotend. This assembly guide comprehensively covers the assembly of a Titan Aero, however if you require any additional information, the assembly guides for Titan and V6 are a good place to start. Screw the nozzle into the heater block into the end with the holes for securing the heater and sensor cartridges. Unscrew the nozzle a 1/4 to a 1/2 turn. Screw the heat break into the other side of the heater block so it is butts up against the nozzle. Gripping the heater block with a spanner, tighten the nozzle with a second spanner. Do not over-tighten, we are going to tighten it up later when the heater block is hot. Deformation of the cartridge making it hard to remove at a later date. 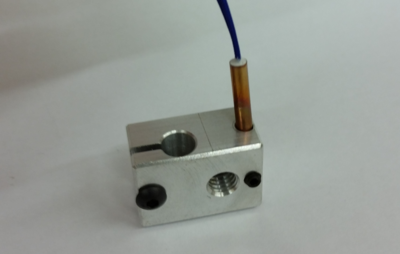 Titan Aero is supplied with a thermistor cartridge, however PT100 and thermocouple cartridges are also available for more accuracy and higher temperature applications, for more information consult the Temperature Sensor Documentation. If you have one, grab a multimeter and check the resistance of your heater cartridge against the values below. Expect your value to deviate a little from these, a difference of around plus or minus 5W is fine, however if yours is significantly off or you are concerned you have the wrong cartridge please get in touch. Insert the Heater Cartridge with the leads exiting the block the same side as the thermistor.​ Centre the cartridge in it's hole in the block. Tighten the clamping portion of the heater block around the heater cartridge with the M3x10 screw. 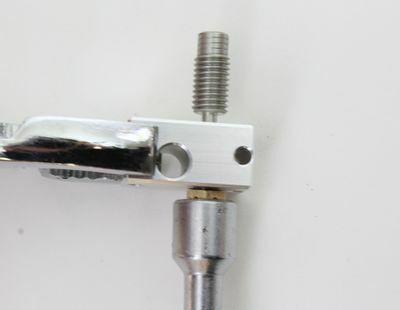 As in the photo below you should be able to see very slight deformation of the heater block clamp as it wraps around the cartridge for maximum thermal contact. Note: The manufacturing process for heater cartridges often results in a degree of irregularity in both diameter and roundness. This is why we use a clamp, to accomodate this and ensure that in spite of the variation we get maximum thermal contact. If you do struggle to get a firm clamp on the cartridge try rotating it. A washer under the head of the M3 screw will enable you to get a much higher clamping load. Use the supplied sachet of thermal compound and apply an even coat of compound to the heatbreak's threads, this will improve thermal performance. The compound should not be used on any of the threads on the hot-side of the heat-break. 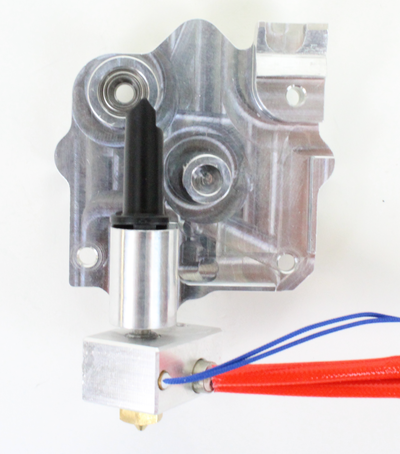 The small sachet of compound contains more than is needed for one hotend, so don't feel like you need to use all of it. If you do apply too much, some compound may seep out, wipe any excess compound away with a tissue before it has time to dry out. The spacer must be at least 2mm thick. This ensures that the pinion gear clears the face of the motor. 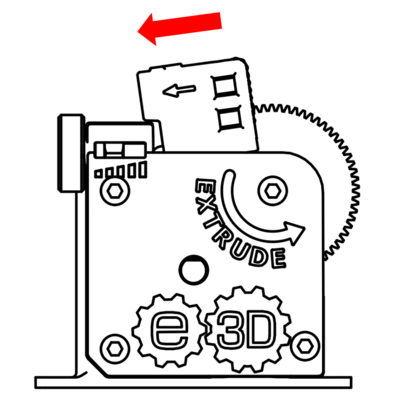 The E3D Titan bracket sold in our store is 2mm thick, the model of this part can also be downloaded from Thingiverse. 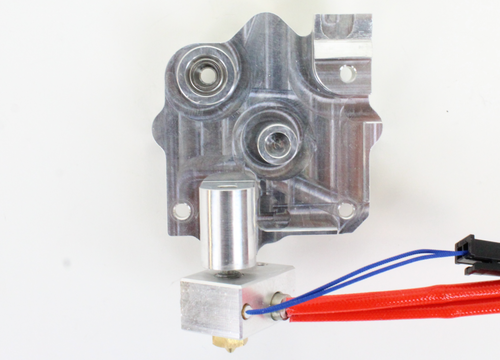 If your mounting circumstances mean the extruder will be held less than 2mm off the face of the motor, you need to print a customisable spacer. If your mounting circumstances requires more than 2mm then you will need to use the longer mounting screws. Here is a list of through-hole mounting thicknesses and associated screw lengths & spacer thicknesses you will need. 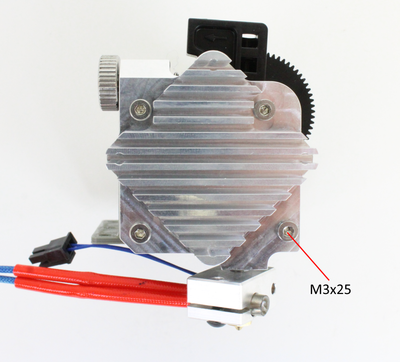 Use the M3 x 8 or M3 x 12 screw to hold the extruder body in place. Screw the M3 grub screw loosely into the steel pinion gear. Slide the steel gear onto the motor shaft, oriented such that the grub screw is closest to the motor. To set the height of the steel gear, drop the acetal gear with filament drive shaft into the bearing, then line up the top surfaces (facing away from the motor) of the gears so that they are flush. To ensure that positioning is accurate, squeeze the assembly together to ensure that the everything is sitting where it will be once it’s all tightened up. Tighten the grub screw to secure the steel gear in place. If your motor shaft has a flat section do tighten the grub screw down onto the flat for optimal grip. There are 2 options for adjusting the tension on a Titan. An M4 button head screw (left) or an M4 thumbscrew (right). The thumbscrew allows you to adjust the tension without tools whereas the button head does not, however it is more compact. Otherwise they are functionally the same, so the choice is purely your own preference. Locate the spring around the threaded part of the screw. Drop this assembly into the nut-channel in the extruder body. Warning: Do not compress the spring without the lid on, and always ensure the idler tension is set to minimum before removing the lid. Failure to do so can cause the spring / screw to pop out and fly to the other side of the room. In the best-case this will be a waste your time spent looking for it, worst-case it may hit someone in the face. 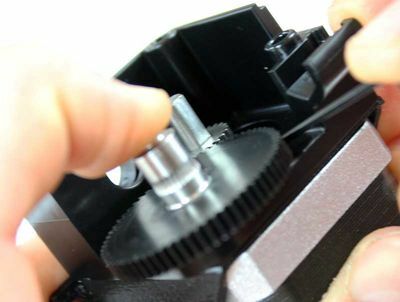 Slide the idler lever onto the motor shaft, ensuring that the spring locates onto the bump on the back of the idler. The early version of the 1.75 standard heatsink also requires a nylon spacer between the idler lever and the heatsink. An early version can be identified by the fact the hole for the motor shaft does not go all the way through the heatsink. There is a slight difference between 1.75mm and 3mm systems for this step. Cut a 23mm length of PTFE and insert it fully into the top of the heatbreak. To reduce the possibility of jams, ensure that both ends of the PTFE are cut squarely and the ends are not deformed, we recommend using a sharp knife rather than scissors for this. Slide the 1.75mm filament guide over the protruding PTFE, ensure that the guide sits flush against the Aero sink. 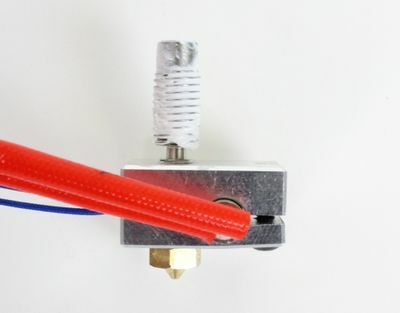 The 3mm filament guide does not require any PTFE between it and the heatbreak. Simply hold the filament guide in the same location as the 1.75mm instructions, when the assembly is screwed together it will be constrained in place against the Aero heatsink and the Titan body. The 2 halves of the assembly can now be screwed together, using the either the 30mm or 35mm screws as explained in Extruder Body. Screw in the bottom left, top left and top right positions with your chosen screw length. Use the remaining M3x25mm screw to attach the bottom right corner. 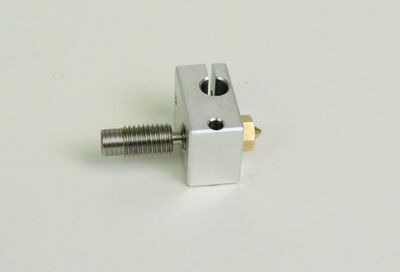 This screws into the brass insert in the back of the extruder body, so is independent of which ever length screws you are using for the other 3 corners. Place the fan on top of the heatsink fins and use the 2.9x13mm self tapping screws to secure it in place. Do not over-tighten the screws as this can crack the fan. 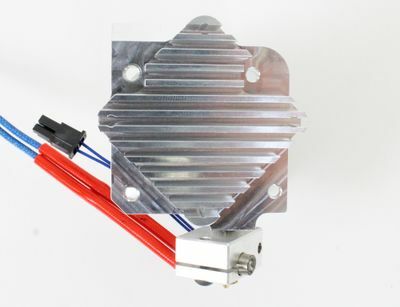 Note: For the Titan Aero to dissipate heat efficiently there needs to be adequate airflow over the heatsink, as such when deciding how to mount the extruder it is best to not over enclose it. Now that you have completed the assembly, check that the large Acetal gear moves smoothly and that it fully meshes with the steel gear. If the gear is hard to move, loosen off the corresponding M3 screw in the Aero sink until it moves freely. 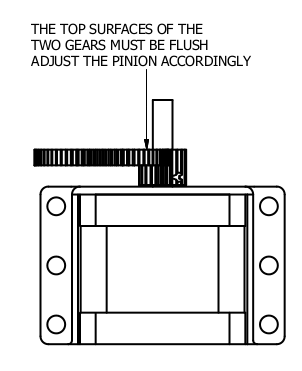 If the gear is still hard to move - check the position of the steel pinion gear, it may be too far forward. 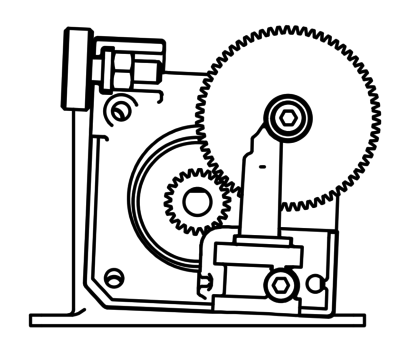 If the gear exhibits “backlash” (improper meshing), loosen all screws on the lid and rotate the body such that the gears fully mesh. Re-tighten up the screws on the lid. When the extruder is ready to use, ensure that you put a piece of 4mm OD, 2mm ID PTFE tubing into the hole in the top of the idler. This will provide guidance for the filament. Without this, the filament risks coming off the hobbed area of the extruder. This is not required for 3mm filament. 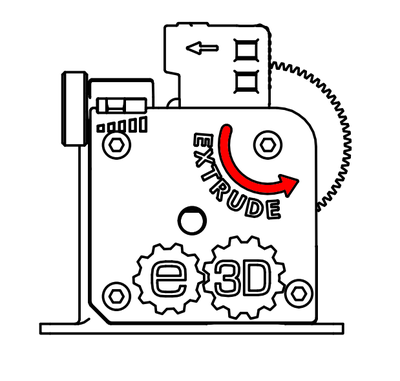 Before running the extruder, updates may need to be made to the firmware for both the extruder and the hotend. 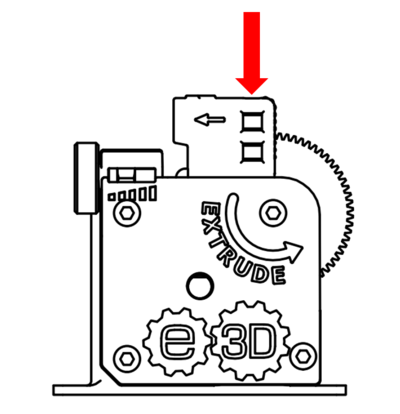 Ensure that the extruder steps per mm value is correct in the firmware so that your printer extrudes the correct ammount of filament. As Titan uses a known gearing ratio and a consistently machined drive gear, we can offer a fairly accurate steps / mm set-point. To test your value, mark the filament 120mm from the extruder then extrude 100mm slowly. Measure the new distance to the mark if you do not measure 20mm after extrusion has finished, you may need to tweak this value accordingly. Ensure that your firmware settings are correct for the hotend's temperature sensor. 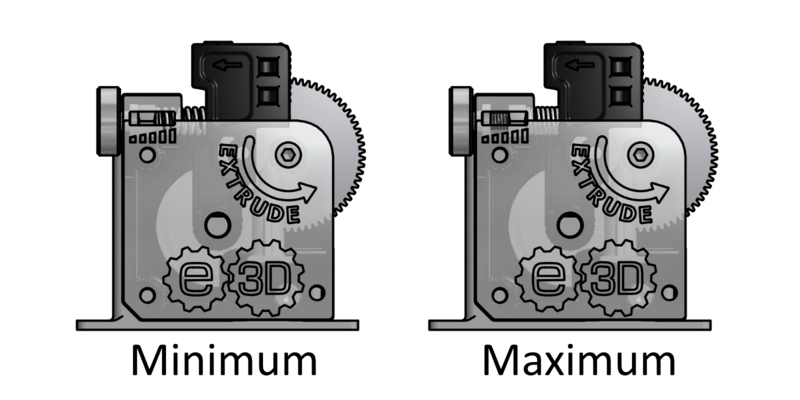 The E3D-v6 Firmware Configuration section shows how to implement this for the supplied thermistor sensor on a range of common firmwares. 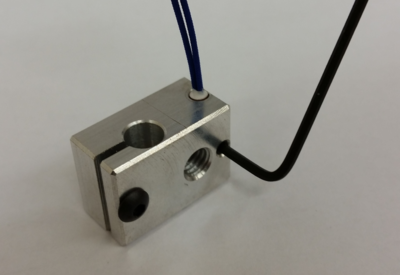 PID Tuning ensures that the hotend gets up to temperature correctly, with minimal overshoot and oscillation. Set the HotEnd temperature to 285ºC. If you did not do a PID tune, then approach this temperature slowly, exceeding 295ºC may permanently damage the thermistor. 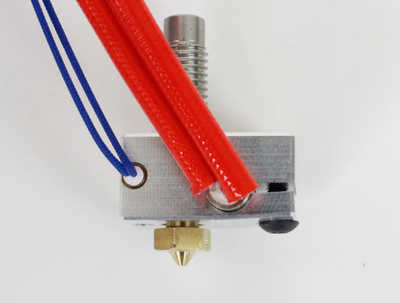 As the components of the hotend will expand as they get up to printing temperatures, the hotend must be re-tightened while hot to prevent leaking of plastic. When the hotend is at temperature, tighten the nozzle whilst holding the heater block with a spanner. You want to aim for 3Nm of torque on the hot nozzle, this is about as much pressure as you can apply with one finger on a small spanner. 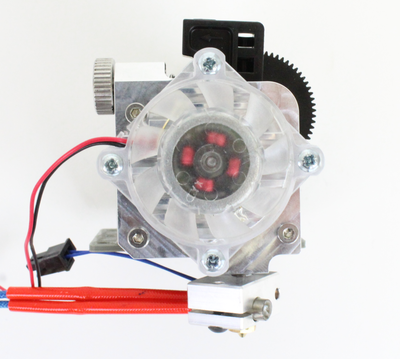 Your extruder is now ready to use. Happy Printing! Slightly reduce the idler force by turning the adjustment wheel clockwise. Feed the filament through the top of the idler. 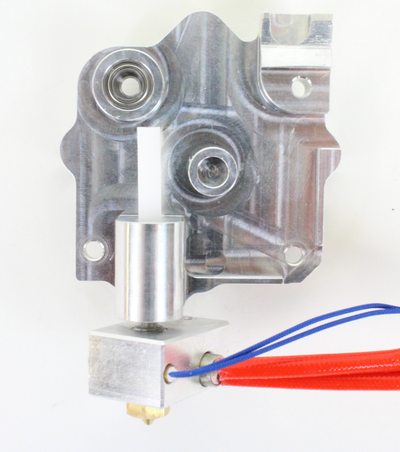 Pull the idler back and continue to feed the filament into the extruder. 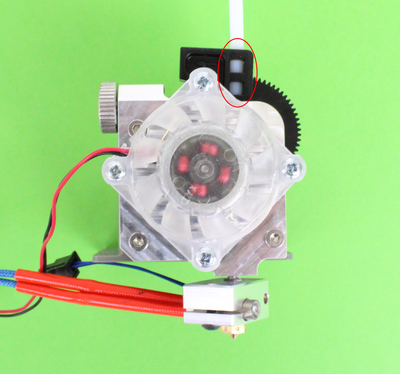 Rotate the large gear by hand to feed the filament the remainder of the way into the hotend. 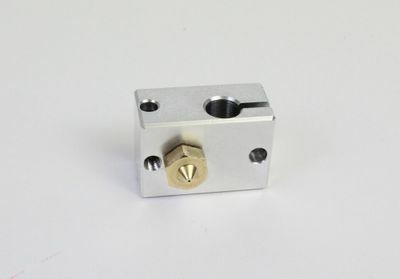 You will know you have reached the hotend as the gear will start to put up more resistance. To unload filament, simply do the loading procedure in reverse. 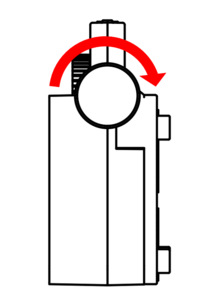 The idler force can be adjusted using the thumb wheel on the side of the extruder. The nut and spring that actually apply the force can be viewed through the lid, giving a quick indicator of the force being applied. The force required will depend on a range of parameters, such as filament material, filament diameter, extrusion rate etc. As a general rule softer filaments (such as flexibles) will need less force than harder ones as the hobb can more easily grip them. The idler force does not need to be perfect in order to print, however to get the best settings for your printer and material combination we advise a little bit of experimentation to find a setting that feels right. If you can hear the gears clicking against each other during printing (normally on retraction) this is most likely caused by backlash (the gears being able to move very slightly, independently of one and other). You can check for this by trying to move the large gear by hand, it will probably move freely over a very small angle. Backlash is caused by poor gear alignment, a highly exaggerated example of this is shown in the picture. 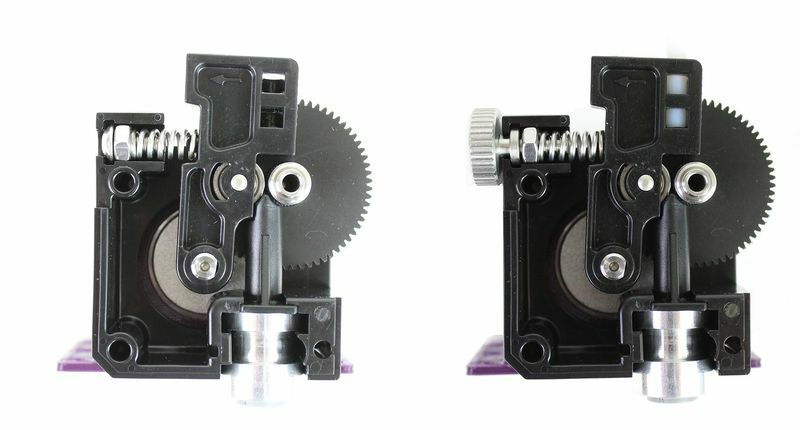 The fix is simple, loosen the 3 screws that hold the body to the motor and rotate the extruder such that the gears are fully meshed. You know they are fully meshed when the large gear is no longer able to move freely. Re-tighten the screws on the lid and the problem should be fixed. 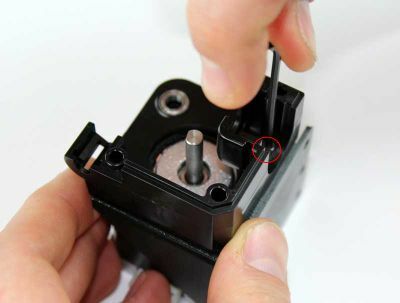 If you are unable to get the gears to fully mesh by removing the screws on the lid, it may be necessary to loosen the screw behind the groove-mount and adjust the body position. Ensure the PTFE is installed in the idler. Ensure that the steel pinion gear is not too far back towards the motor, allowing the idler to slide back and forth along the motor shaft. Be sure that the steel pinion gear is not above the height of the Acetal gear. If it is, the idler will pinch it when the lid is fitted. Excessively long retractions will cause issues by dragging soft filament into cold areas. E3D-v6 hotends need less retraction than most hotends. For direct extrusion systems you should use anywhere from 0.5mm-1.0mm, for bowden systems you might want to go up to 2mm. Retraction beyond 2mm is likely to cause issues. The heatsink must be cooled! Heated chambers, fan ducts that restrict flow, and not having the fan running at 100% at all times are common causes of issues. The heatsink should be cool to the touch at all times. If your heatsink is warm to the touch then you have a cooling issue that must be addressed. This page was last modified on 9 May 2017, at 08:37.